As the jury showed a great interest in my stove and the concept of distribution, I would like to introduce the project to you, members of the HEDON forum, whose work i ve been introduced to as me being a member also. Maybe you can help me with additional aspects in re-evaluating the project realisation, since i don t have basically no experiences with it. I have a plan to set an internet page, but until then, i only can send pictures to the one who is interested, personally, not on the FORUM itself. Have a nice day and enjoy working! 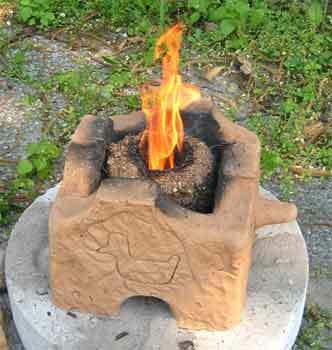 Maybe you can find usable also my solution of the stove, using biomass briquette fuel. I introduced it once on the Forum, it is called Mdula stove and it is a result of our international team, based in Helsinki University with a cooperation of WWF in Chembe, Malawi. Since I am based in Europe I can hardly communicate the stove project to be fully realized in Malawi. I stayed in Chembe for some time and I know it is impossible to execute the project there if not being fully engaged in local culture, people and the design and logistics process at least for a couple of years - and i cannot do that now. 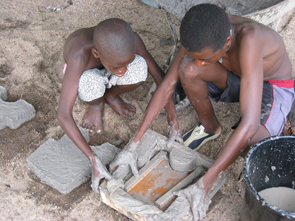 molds can be made in every village. Maybe the site can help the stove project, I can arrange all the infoneeded. Or maybe you can see an alternative to it? Well, if interested, please contact me. I feel very happy about your interest in the stove. Sure you can use my info and pics and share them with other stovers, this can be an efficient beggining of the execution of the project. I think the stove with its flexible design can still be developed further on to satisfy local needs. And this is what local people should do. i have a presentation about the stove next week, i was promised that some of the finnish ministry people will show up, but i doupt. Anyhow i am quite busy with it, so i will answer to your mail in next few days. I am putting together a movie about cooking Nsima and Fish and after it theres a short guide about making the stove. We ve had a concept about a cooking book, as a nutrition guide, for local people. It would be some sort of a comic color-in book without words, only simple drawings, so local kids can be engaged also. I can arrange you a copy. And inside you can also find the how-to guide of puting up a stove with tools you can all find in the willage. Maybe we can develop it further on and make silkscreens for press. As i said, i will look at your press more in details, it looks quite efficient as a semi automatic machine. Thanks again for the interest, enjoy working! Step1,2: Fill the clay mix (clay, sawdust/ashes/sand) in the mold. Step3: Press the clay out of the mold. Step4,5: Bind the modules together while still wet, but hard enough to lift. Leave it in the shadow for 2 or 3 days, then in the sun for final drying. 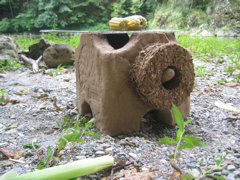 Final stove with the briquette holder that you can attach on the wall - it warms up the briquette before burning, it protects the stove walls being touched by kids. you can use the holders also to carry the stove around also when it is hot! 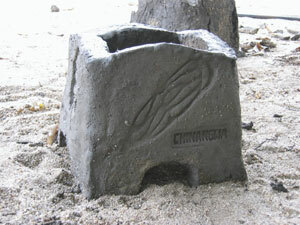 The briquette press that is used in Chembe, Malawi. There are plenty of other pics, but iI think this will do for the first impression. Thank you again for taking concern for our project. Have a successful and creative week!